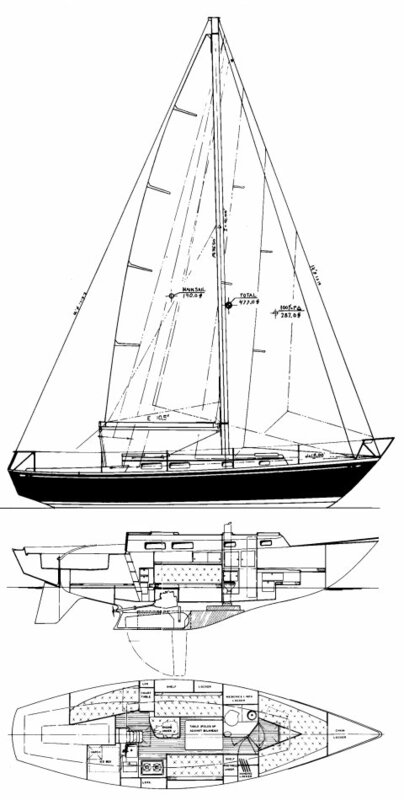 "In 1967 the boatbuilding firm of Douglass & McLeod Plastics Corporation, makers of the Tartan line of sailboats, commissioned Olin Stephens to design what the company called a “high performance offshore cruising racing boat.” The company wanted a boat that would fill the marketing gap between their 27-footer (also designed by Stephens) and their Blackwatch 37, a Ted Hood design. The result, the Tartan 34C (C for “classic”), was a success by any yardstick, with 525 boats built between 1967 and 1978. The T34C was introduced in December of 1967 and in the Southern Ocean Racing Conference’s 1968 race a T34C won her class. The boat has gone on to win numerous offshore races, including the Port Huron-Mackinac and the Marblehead-Halifax races, among many others. At least one circumnavigation and too many Atlantic and Pacific passages to list easily have been done by T34C sailors." Temujin has been extensively refitted over the course of her life. Once owned by George Colligan, a legend in the Tartan 34C community, Temujin served as the model boat for many upgrades and projects meticulously cataloged in the Tartan 34c owner's forum. More recently, Kennon and Eric have made upgrades for long-distance offshore passagemaking. Some specific modifications to Temujin differentiating her from other Tartan 34's include a removable inner forestay for conversion to a cutter rig, running backstays and baby forestay, rigid vang, a Yanmar 3JH3E diesel engine, a Monitor windvane, autopilot, and solar power.